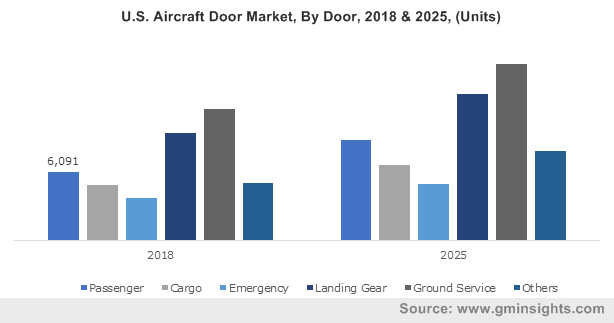 Aircraft Door Market size was valued at over USD 5.5 billion in 2018 and is estimated to exhibit around 7.5% CAGR from 2019 to 2025. Increasing consumer spending in conjunction with shifting preference towards air travel will drive the aircraft door market size during the projected timeframe. Rising commercial aircraft production and deliveries to accommodate passengers will propel the product demand. According to International Air Transport Association (IATA), the air passenger traffic is bound to cross 7 billion by 2035 with a yearly growth of over 3.5%. 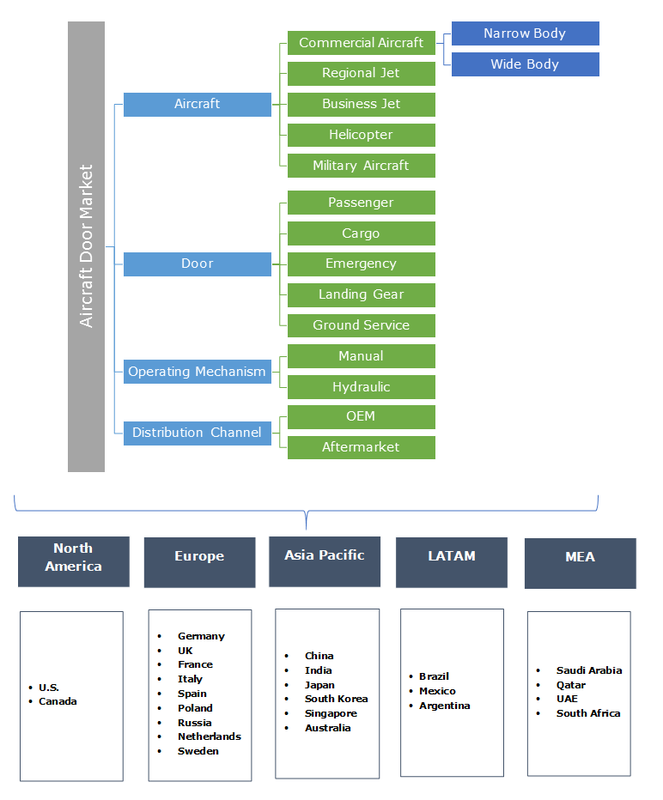 Proliferating tourism industry and emergence of low-cost carriers will positively influence aircraft door market share. Growing adoption of light weight air carriers for superior fuel efficiency and to meet carbon emission regulations will support industry growth. Airplane manufacturers are adopting innovative design processes to enhance manufacturing capabilities. For instance, in October 2018, Airbus announced strategic collaboration with Georgia Institute of Technology to transform airplane structure designing process. Rising military air carriers demand to ensure aerial supremacy will boost aircraft door market growth. Countries including the U.S. and China are increasing defense budget to adopt high performance military airplanes. In 2018, the U.S. Defense announced to allocate around USD 700 billion for military segment with over USD 10 billion for fighter jets. Moreover, ongoing refurbishment activities and replacement of in-service airplanes will drive market size. Ongoing initiatives to develop infrastructure development capabilities will enhance industry size over study timeframe. For instance, in May 2018, International Civil Aviation Organization (ICAO) signed a MOU with New Partnership for Africa’s Development for aviation infrastructure development and capacity building in Africa. In 2018, the commercial aircraft held over 45% share in aircraft door market owing to rising air carrier fleets. Upsurge in revenue generation from commercial airlines is supporting industry growth. For instance, according to IATA, in December 2018, the annual revenue generated from commercial airliners increased by 6.5% and rose to around USD 755 billion as compared to USD 709 billion in 2016.
Business jets will witness significant growth with globalization and increasing trade activities. Rising adoption of private jets by organizations for business trips and conferences will drive the market. According to Russian United Business Aviation Association (RUBAA), in 2017, business jet traffic increased by around 2.5% as compared to 2016. Moreover, increasing refurbishment activities to enhance cabin interiors will propel product demand. Passenger door will account for over 35% of the aircraft door market size by 2025 with its adoption for entrance and exit to the cabin area. Aviation industry participants are incorporating doors with retractable steps and folding handrails to increase cabin space and ease of operation. Manufacturers are focusing on implementing composite materials to enhance tensile strength and other physical properties. For instance, in April 2015, Premium AEROTEC installed carbon fibre composite material (CFRP) doors in A350-1000 to reduce production cost and overall weight. Landing gear doors will witness significant growth with its installation for effective functioning of landing gears during flight operations and ground maneuvering. Industrial participants are undergoing product tests to ensure effective functioning while airplane maneuvering. For instance, in September 2015, Daher delivered main landing gear door for kinematics test program of A350-1000. Hydraulic operating door will witness over 5.5% CAGR by 2025 owing to its adoption for reducing efforts of cabin crew member. Airliners are implementing innovative technologies to ease door operation mechanism and ensure cabin safety. For instance, in March 2017, Latecoere launched passenger door with electric motor to lower the complications and operational errors. Further, it enables the cabin crew for safety slide preparation in emergency evacuation. Manual operating door will witness significant growth in aircraft door marketplace over the forecast timeframe owing to its adoption for doors in small air carriers and emergency exits. Benefits such as low manufacturing cost as compared to hydraulic advocates its implementation over study timeframe. However, higher maintenance cost will limit its penetration in next six years. OEM leads the market share owing to rising airplane production to meet previous production backlogs. For instance, in October 2018, Bombardier Aerospace had a backlog of over USD 14 billion. OEMs are continuously strengthening the supply chain network to enhance manufacturing capability and overall production. Further, improving economic condition in emerging nations is driving aviation industry and positively influencing product demand. Aftermarket segment will foresee significant growth over study timeframe with increasing maintenance and retrofit activities for in-service airplane fleets. In 2018, North America accounted for over 45% share owing to presence of multiple airplane manufacturers. Increasing military modernization programs for aircrafts including fighter jets will support product demand. For instance, in November 2018, FAA along with the U.S. army has initiated aviation modernization program for more efficient and safer jets. Further, technological progression in the conventional system with innovative aviation systems will enhance the aircraft door market size by 2024. Asia Pacific will witness strong growth with rising passenger traffic. According to Association of Asia Pacific Airlines (AAPA) in 2018, the passenger traffic grew by around 8% and air cargo grew by over 4.5% as compared to 2017. Further, rising affordability and low flight fares will further boost the product penetration. Major participants of aircraft door market include Saab, Latecoere, Mitsubishi Heavy Industries, Elbit Systems and Daher Socata. Industry participants are involved in long term agreements with international airline operators to boost their market share. For instance, in June 2018, triumph group signed an agreement with Boeing to supply aerospace structures including horizontal stabilizers, doors, and wing sections. Aircraft door are allocated for access control and management of compartments in air carriers. The structures enable in entry and exit into cabin, loading and unloading of cargo and ground service. Government regulations such as Federal Aviation Administration (FAA) govern the designing and manufacturing of air carriers’ structure. For instance, FAA Title 49 provides requirement of air carriers to improve cabin safety.